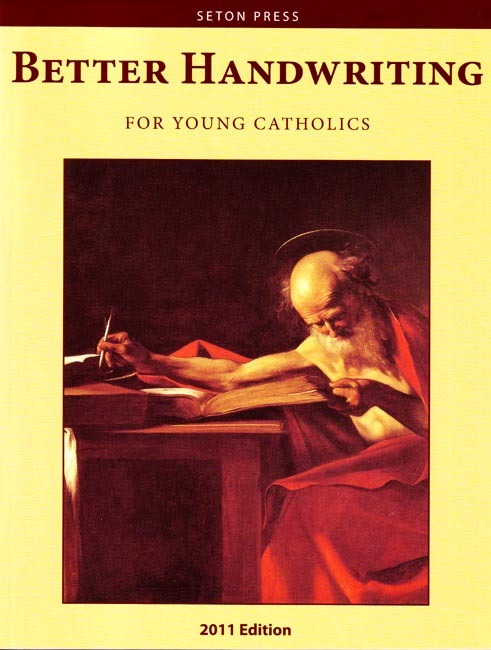 Seton Home Study School staff developed Better Handwriting for Young Catholics, Grades 6-8 to reinforce the Catholic student's handwriting skills in cursive letters, and to promote further progress, ease, fluency, and efficiency in cursive handwriting. This final text in the Handwriting for Young Catholics series, by Seton Press, presents forty different countries of the world, with capital cities, their patron saints, and places of interest to Catholic students. These lessons are intended to supplement our Grade 6 world history studies (see Our Catholic Legacy ). Through these handwriting lessons, your student will learn basic facts for each country, as well as interesting information about Catholic cathedrals, shrines, or other points of Catholic historical interest. The entire series of Seton handwriting books follow the Zaner-Bloser method. In the beginning of the text is a review of upper and lowercase manuscript and cursive letters and writing strokes. With more use of computers these days, many students are not learning how to write legibly. This book will help to further develop and reinforce the still important skill of legible penmanship. Beautiful full color photos. Copyright 2011. 8.5 x 11 inches. Soft cover. 209 pp.